The aim of this book is to provide an inexpensive and accessible text that discusses issues of qualitative research and its potential role in enhancing the theoretical base of both occupational and physical therapy. The comprehensive coverage is useful to students, researchers, and clinicians who seek a greater understanding of qualitative research and its use within the professions of occupational and physical therapy. As more and more clients request evidence-bases service, this resource can aid practitioners in using qualitative methods to demonstrate their effectiveness. The material addresses a subject of increasing concern and relevance to therapists. 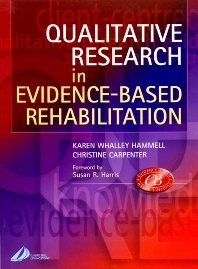 Thorough explanations demonstrate the relevance of qualitative research for evidence-based practice. The text explores issues specific to the field of rehabilitation and focusses specifically on those important to OT and PT. Information links theory, research and practice in an understandable way. Illustrations of "real" research and practice examples aid the reader in applying their new-found knowledge to real-life issues. The book is written in a readable style which makes the book accessible for students and non-academically minded practitioners. The contribution of qualitative research to evidence-based practice. 2. Using qualitative evidence to inform theories of occupation. 3. Exploring leisure meanings that inform client-centred practice. 4. Building knowledge through participatory research. 5. Using qualitative focus groups to evaluate health programmes and service delivery. 6. Ensuring a client perspective in evidence based rehabilitation. 7. Integrating grounded theory and action research to develop guidelines for sensitive practice with childhood sexual abuse survivors. 8. How qualitative research evidence can inform and challenge occupational therapy practice. 9. Using a multiple case study research design to develop an understanding of clinical expertise in physical therapy. 10. Exploring views and perceptions of evidence-based practice influencing practice.